We Are Thankful For Our Coast Brides-To-Be! Happy Thanksgiving from Coast Diamond! Click image for our #ShowYourCoast Pinterest page. Josh customized a Coast Diamond engagement ring LC10291 with a braided band by choosing a princess cut diamond center stone for his proposal to Alissa. Click image for more #ShowyourCoast Pinterest moments. Garrett proposed to Hannah with this Coast Diamond engagement ring LC5403 of delicate prong set diamonds that create a brilliant halo to accent a round diamond center stone. A classic Coast Diamond solitaire engagement ring LC10387 like Melissa’s is dazzling with a scalloped band of diamonds and milgrain edging. Forever found Kayla at the French Quarter in New Orleans. She said “OUI!” to a gorgeous Coast Diamond double halo engagement ring LC10007. Click image for more #ShowYourCoast moments from our Pinterest page. The beautiful princess said ‘yes’ to her prince’s proposal on a Disney caricature drawing! David proposed to Joanne with an elegant Coast Diamond halo engagement ring LC10213. We invite all our Coast Brides-To-Be to share their #ShowYourCoast moments on Pinterest, Facebook, Instagram, Twitter… It is a joy for us to see all the happy Coast brides-to-be on the special day they become engaged with a Coast Diamond ring. Congratulations to each and every Coast Bride-To-Be! We are thankful for you! They have done it again! 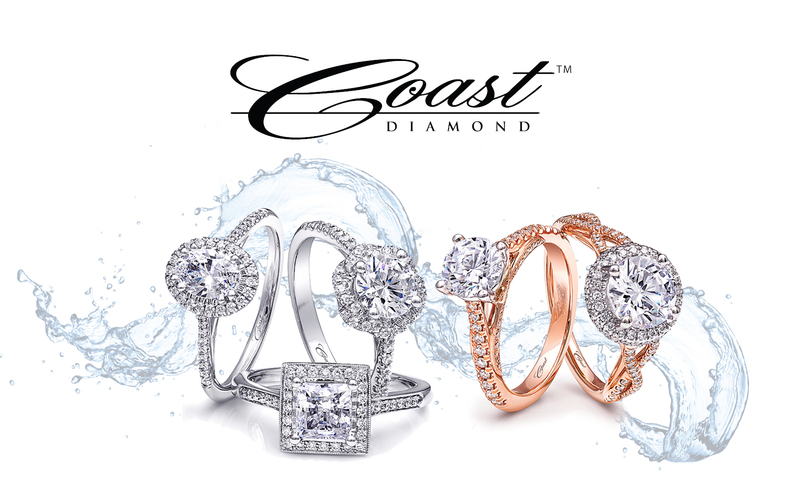 Coast Diamond Featured Retailer of the Week! D. Geller & Son of Kennesaw, GA is not only “Where Atlanta Gets Engaged” but they are an award winning fine jewelry store for the personal care they give to each and every customer that visits their store. During the holiday season it is nice to know there is a place you can shop to get some help with your holiday shopping list (who doesn’t love a beautiful piece of jewelry?). Or if you are planning the holiday engagement of a lifetime, D. Geller & Son will personally help you make it unforgettable. It is for their attention to detail and personalized customer service that, once again, D. Geller & Son of Kennesaw, GA is the Coast Diamond Featured Retailer of the Week. From the D. Geller & Son Facebook page: a Coast Diamond three stone ring set with a gorgeous electric blue Paraiba center stone. Click image for details. During the Holiday Season things can get a little stressful. If you are planning a holiday proposal… they can get really stressful. We think fun and a sense of humor are the perfect addition to the knowledge and personalized customer service you will find at D. Geller & Son. They are the perfect choice to find THE Coast Diamond ring for your holiday engagement. Sparkling Tradition is how we describe this 1.5 CT Coast Diamond wedding set (LC6033-WC6033). Click image for details. Stop Her in Her Holiday Tracks with this Coast Diamond engagement ring (LC5449) of intertwining diamonds that create a unique halo for maximum sparkle. Click image for details. Joy Will Light Up Her Face when she sees this Coast Diamond cushion shaped halo engagement ring (LC5391) with pave set diamonds and milgrain edging. Click image for details. Congratulations D. Geller & Son of Kennesaw, GA for providing your customers with award-winning personalized care and for being our Coast Diamond Featured Retailer of the Week! As you browse the many resources available to find the perfect place to buy your engagement ring you will find that Costello Jewelry Company of Chicago has a uniquely high number of “5 Stars” and exceptional reviews for both of their locations, Naperville and Glen Ellyn. Visit their Facebook Page and you will see their statement, “We love love. Passion, adoration, and life-long relationships are our motivation; impeccable jewelry is our result.” As a jewelry designer, both exceptional reviews and an expressed passion for the customer are very important to us as we choose our authorized dealers. Costello Jewelry Company has both and that is why Coast Diamond is thrilled that Costello’s is this week’s Coast Diamond Featured Retailer. Costello Jewelry Company’s wonderful reviews include all of their services and expertise. Click on the image to visit their website and see for yourself what everyone is talking about. “Costello Jewelry Company houses a staff of seasoned craftsmen, GIA graduate Gemologists, and client service associates who are tenured, knowledgeable, sincere, and most of all, trained to worry about the customer and not the sale.” The minute you walk into either of their stores you feel the warmth and security of a place that will help you begin the journey of your holiday engagement with a Coast Diamond ring. A Forever Favorite this vintage Coast Diamond halo engagement ring (LC5257-0.50) is a best seller at Costello Jewelry Company year after year. Click image for details. A Wonderfully Unique Coast Diamond engagement ring (LC10008) with a double row of diamonds that split at the solitaire diamond of your choice. Shown with the matching band (WC10008). Click image for details. Two Intertwine in this Coast Diamond 1CT solitaire engagement ring (LC10291) with a braided diamond shank. Click image for details. Costello Jewelry Company has a complete selection of Coast Diamond engagement rings and matching wedding bands. Stop in at either of their locations in the Chicago area to find your dream Coast Diamond ring for your Holiday Engagement today! November is upon us… Are you ready for Engagement Season! At this time of year there are many a bride-to-be waiting patiently in expectation of the perfect moment when a brilliant Coast Diamond engagement ring is put on her finger. In the Colorado Rocky Mountain region the place to go is Williams Jewelers in Englewood. For over fifty years this third generation, family-owned fine jewelry store has been helping grooms fulfill the expectations of their loved ones dreams, with a Coast Diamond engagement ring. A classic solitaire – A modern halo… whichever you choose, our Coast Diamond Featured Retailer of the Week, Williams Jewelers in Englewood, CO is ready to help you. Bryce and Beth share their Williams Jewelers True Love Story with a proposal in Crested Butte, CO. Which engagement ring design will you choose? The Classic Coast Diamond Solitaire never goes out of style. There are so many ways to personalize a solitaire for your bride to be: set it in platinum or rose gold – a peek-a-boo diamond or ribbons of pavé diamonds under the center stone – a twisted or hand engraved band. The Ever-Popular Coast Diamond Halo Engagement Ring continually wins the heart of a bride. Just like the solitaire you can personalize your Coast Diamond halo engagement ring. There are so many options, with a couple for you to peek at below. The staff at Williams Jewelers is ready to help you choose the perfect Coast Diamond Engagement ring. Stop into their Englewood location today! Congratulations Williams Jewelers for being our Coast Diamond Featured Retailer of the Week!